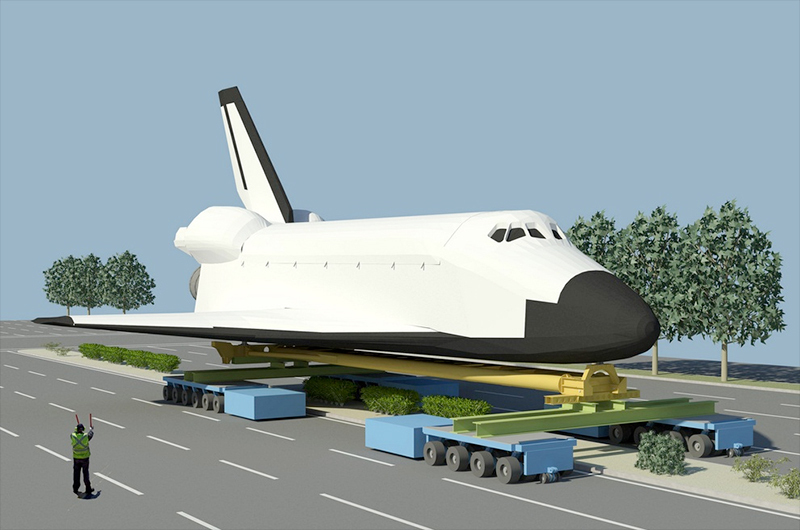 October 8, 2012 — As it turns out, transporting a space shuttle through city streets is a "Big Endeavour." Space shuttle Endeavour, the youngest of NASA's retired orbiters, will depart later this week on a road trip from Los Angeles International Airport (LAX) to its new exhibition at the California Science Center (CSC). 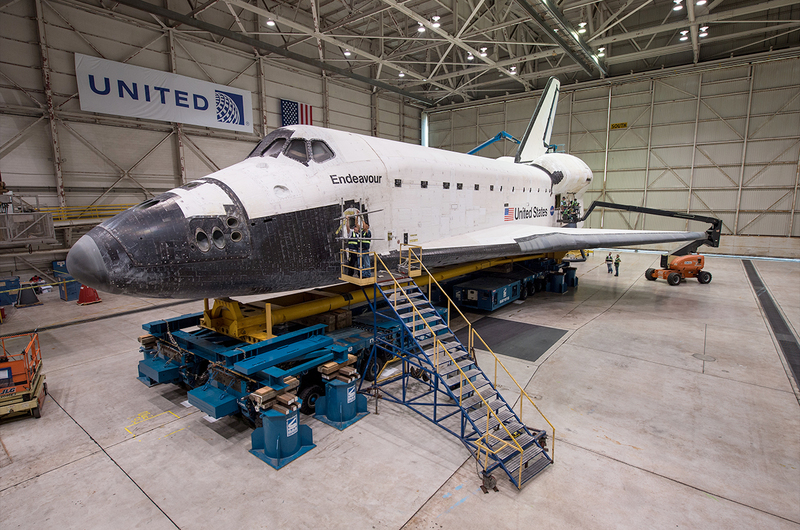 The two day, 12 mile (19 kilometer) journey follows Endeavour's delivery to L.A. atop a jumbo jet last month. The move, which will begin hours before dawn on Friday morning (Oct. 12) and end after nightfall the next day has been dubbed as "Mission 26: The Big Endeavour." 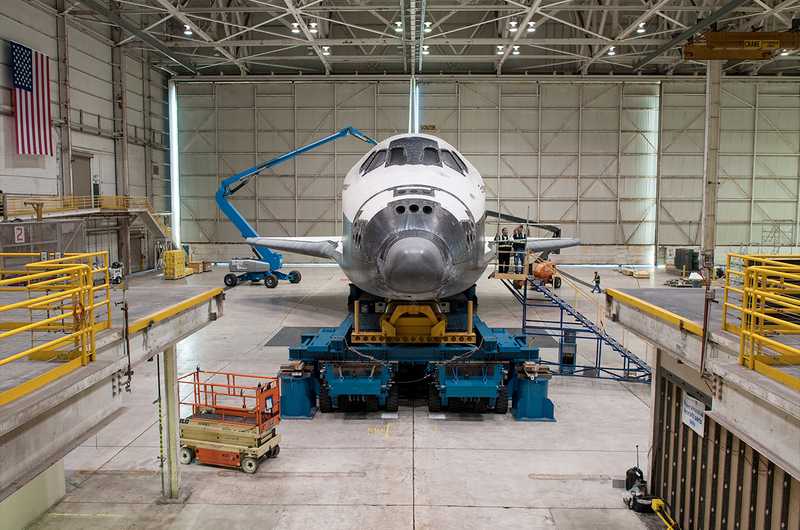 While it was in service to NASA, Endeavour flew 25 missions to space between 1992 and 2011. Mission 26 will take Endeavour through Inglewood and Los Angeles, including passing over the 405 freeway, and pausing for celebrations outside the former indoor arena of the Los Angeles Lakers and at a street intersection where "Fame" actress Debbie Allen has choreographed a tribute. Endeavour will make the journey atop a modified NASA overland transporter, driven most of the time by four self powered, computer controlled vehicles. For a brief stretch though, the shuttle will be towed by a stock Toyota Tundra pickup truck. Despite being initially promoted by Los Angeles' mayor as the "mother of all parades," the logistics of transporting a spacecraft with a 78 foot (24 meter) wingspan and a 58 foot tall (18 meter) tail required the police to shut down streets and sidewalks, limiting public viewing to only a few designated areas along the route. Still, tens of thousands of residents and visitors are expected turn out to witness Endeavour's slow trek to its new home. 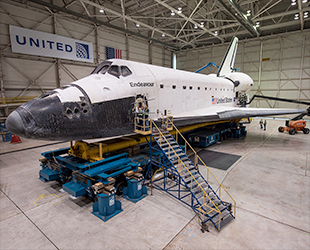 Endeavour is scheduled to depart LAX airport property at around 2 a.m. PDT (5 a.m. EDT; 0900 GMT) Friday (Oct. 11). The first day of the move will be punctuated by short drives and long stops as crews work to raise power lines between the airport and the overpass that the shuttle will cross over the freeway. Endeavour will take Westchester Boulevard to Sepulveda, where it will make its first extended stop for about nine hours in a parking lot as the first set of transformer lines are de-energized and raised. That afternoon, Endeavour will continue down Manchester Boulevard, crossing into Inglewood and stopping for another six hours as its path is cleared. Out of safety concerns involving the power line work, Los Angeles and Inglewood police departments have said that public viewing will be limited on Friday until Endeavour's overnight crossing of the 405 is completed. Originally, the plan was for Toyota to lend one of its stock Tundra trucks to tow the shuttle on its last quarter-mile (400 meters) to the science center. Instead, the pickup will be used to move Endeavour over the freeway due to its computer-driven transporters not being cleared for use on the overpass. 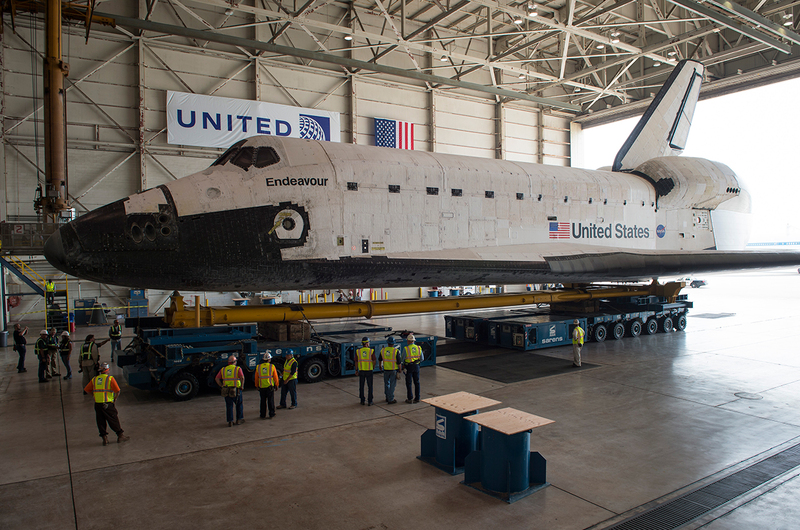 By Saturday morning at around 8 a.m. PDT (11 a.m. EDT; 1500 GMT), Endeavour should be passing by Inglewood City Hall, where it was initially expected to stop. The city hall grounds should still offer plenty of opportunities for the public to see the shuttle on the move, but it will continue on its way to The Forum for a ceremony that will 'launch' Endeavour's final journey. Check the map above to find out the plan for Endeavour's route across Los Angeles and Inglewood. Click here for a larger map. The Inglewood Police Department is anticipating between 10,000 and 14,000 people to turn out for the event at the arena. Leaving The Forum celebration, Endeavour will head back into Los Angeles and pause again at Crenshaw Boulevard and Martin Luther King, Jr. Boulevard for the Debbie Allen production at around 2 p.m. (5 p.m. EDT; 2100 GMT). The intersection will be able to accommodate only about 1,500 spectators, according to the LAPD. Endeavour will then roll along King to Bill Robertson Lane and then turn left into Exposition Park on the final stretch to the California Science Center's Samuel Oschin Space Shuttle Display Pavilion. 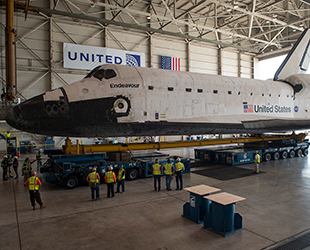 The arrival at the CSC, which is expected around 9 p.m. PDT (midnight EDT; 0400 GMT Oct. 14), may provide the best opportunity for the public to see the Endeavour during its road trip. The center plans to debut Endeavour to the public on Oct. 30. 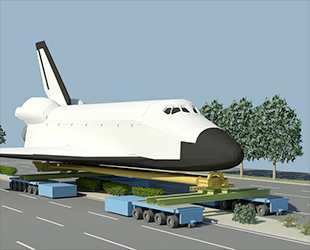 According to city officials, Endeavour will be one of the largest objects ever to be transported over city streets in Los Angeles history. Moving the 155,000 pound (70,300 kilogram) orbiter presented the science center and local police departments significant logistical challenges. "Building [the space shuttle] Endeavour was a marvel of ingenuity and engineering," Los Angeles Mayor Antonio Villaraigosa said in a statement. 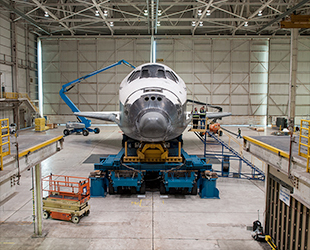 "Moving Endeavour will also be a marvel of ingenuity and engineering. Every step of the way, we have worked to mitigate the concerns of the community. Thanks to this hard work, we expect that the transportation of Endeavour will be celebrated as a truly unique event in our city's history." "We urge all those who are interested in viewing this once in a lifetime event to visit the space shuttle at one of the designated viewing locations or at its new home at the California Science Center," Villaraigosa said. To make way for the space shuttle, the CSC worked with the cities of L.A. and Inglewood to facilitate the temporary removal and re-installation of power lines, traffic signals and street lights as Endeavour traverses through these communities. In evaluating the best route, it also became necessary to remove several hundred trees. For every tree that was removed, up to four trees of higher quality will be planted in its place with other improvements to beautify these areas. Two years of tree maintenance will also be provided by the CSC Foundation. According to the LAPD, extremely large crowds from all over Southern California are anticipated to show up in an attempt to see the shuttle in its final miles through the streets. Due to the road closures and limited parking, the police have cautioned that this influx will likely result in significant traffic congestion and long delays in and out of the area.